Chicago style is one of the referencing styles that are rarely presented in modern academic works. In the same time, students and numerous researches prefer this citation style the most. The sixteenth issue of the Chicago Manual of Style reveals the main rules and requirements of the referring style. It is easy to find it online or at bookstores. If you need to deal with Chicago style paper, we are willing to help you with your academic assignments. We have already completed thousands of works written in different formatting styles, including Chicago style. Use TAB for every new paragraph indentation. Use the UPPER CASE to type the paper heading. Press Enter seven times to place the title properly on the page. Center the title of the page. Press Enter eight times more. Write down your first and last name and press Enter one time. Write down your class’s name and press Enter one time. Write down the current date. 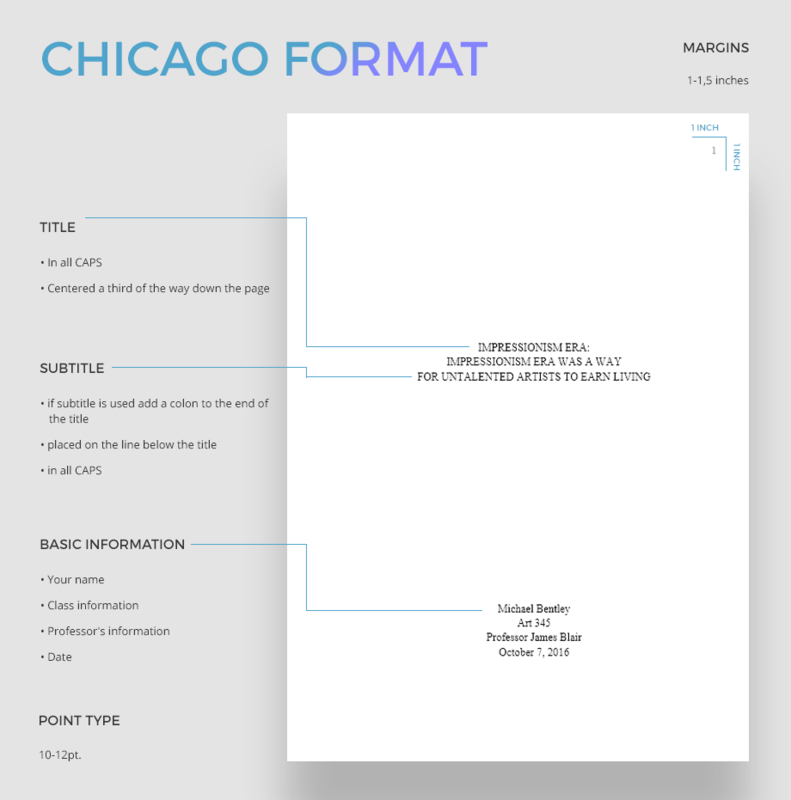 Following the mentioned requirements, you will provide an accurately formatted Chicago style cover page. Endnote format (Chicago Style 16B). When dealing with academic paper formatting, it is important to provide a paper written according to requirements provided by your college tutor of a professor. When you write your paper using Chicago formatting style, look through the footnotes & endnotes benefits. This is the most preferable formatting style for papers written in such fields of science like history, literature, and arts. The widely used author-date style is more relevant to social disciplines papers. When you conduct a research in an economy, linguistics, law, international relations, culture, phycology, communication and other social sciences related disciplines you can use endnote style very efficiently. When citing your sources due to this style, it is preferred to use superscript numbers when quoting the piece of information taken from a book or journal. Footnotes & Endnotes Style does not require alphabetical page numbering once placed at the reference list. It is better to list the sources in order of their appearance in the text. Every paper must have the bibliography page or the footnote section where superscript numbers cover the information about the author and the publication. While footnotes include the information about the bibliography put at the end of the page, endnotes require the information about your cited books to be placed at the end of the entire paper, particularly, in the bibliography section. You can remember this rule easily due to the names: footnotes are placed at the footer of the page, and endnotes are put at the end of the paper. The widely used author-date style is more relevant to social disciplines papers. It requires citing the author by its name and list every source material in alphabetical order. If you need to deal with Chicago style paper efficiently, we are willing to help you with your academic assignments accomplishment.